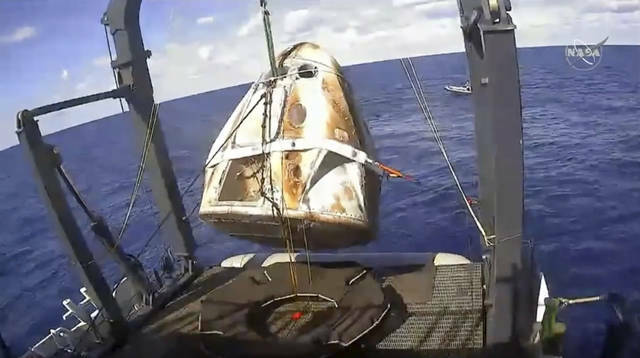 CAPE CANAVERAL, Fla. (AP) — SpaceX’s swanky new crew capsule returned from the International Space Station to an old-fashioned splashdown in the Atlantic on Friday, successfully ending a test flight that could lead to astronaut rides later this year. 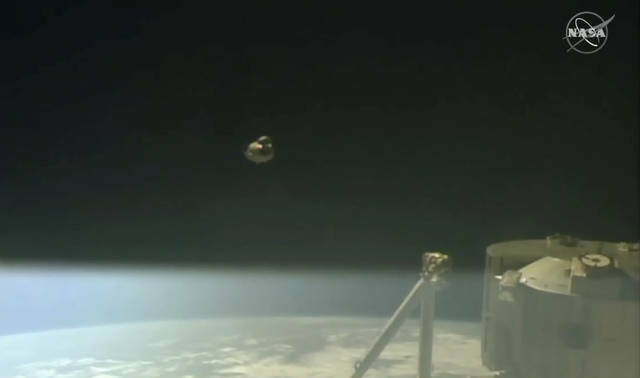 The Dragon capsule undocked from the orbiting lab early Friday. Six hours later, the capsule carrying a test dummy parachuted into the ocean, a couple hundred miles off the Florida coast. It was the final hurdle for the six-day demo, a critical prelude to SpaceX’s first flight with astronauts as early as summer. While improvements still need to be made, the company aims to fly NASA astronauts Bob Behnken and Doug Hurley on the next test flight. Astronauts have not launched from Florida for eight years, and NASA is eager to end the drought and reduce its costly dependence on Russia for space station trips. SpaceX employees cheered and applauded at company headquarters near Los Angeles when the Dragon’s red and white parachutes popped open. NASA televised the descent live, the dramatic views coming from a plane. The crowd went wild once the capsule splashed down and was seen floating upright. “Just amazing. I can’t believe how well the whole mission has gone” with all major milestones met, said Benji Reed, SpaceX’s director of crew mission management. Space station astronauts have been stuck riding Russian rockets since NASA’s shuttles retired in 2011. NASA is counting on SpaceX and Boeing to start launching astronauts this year. SpaceX — which has been delivering station cargo for years — is shooting for summer. NASA Administrator Jim Bridenstine was ecstatic following splashdown. All this is “leading to a day where we are launching American astronauts on American rockets from American soil,” he said. A pair of recovery ships was stationed in the Atlantic well before splashdown and quickly moved in, lifting the capsule from the water within an hour. The capsule is expected at Port Canaveral on Saturday night. 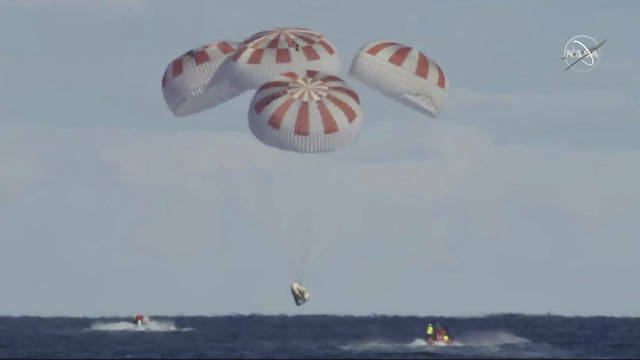 Splashdown will occur much closer to shore once astronauts start flying. Astronaut Shane Kimbrough, part of the recovery team, said it was incredible watching the splashdown up close. The capsule had brown scorch marks from top to bottom, but otherwise looked fine. NASA awarded the first contracts in 2014 to SpaceX and Boeing, now totaling about $8 billion. This first SpaceX test flight opens a new era, Bridenstine said, with new technology and new business approaches. Disclosure statement: Ian MacDonald receives funding from NOAA, the Gulf of Mexico Research Initiative and the ECOGIG-2 Consortium He was an expert witness in a lawsuit against the operators of the leaking Taylor Energy well, and has consulted for government agencies on the spill and produced past estimates of the oil discharge rate at the site. He serves as faculty adviser for Florida State University’s Surfrider Club. These valves apparently failed, because miles-long oil slicks have been seen on the waters above ever since the 2004 mudslide. Despite years of effort and expenditure of more than US $230 million, oil is still flowing from beneath the legs of the downed platform at a magnitude I estimate to be at least 100 barrels per day. This event is the longest oil spill in U.S. history. Jon Richfield, logged in via Facebook: This certainly is a hair-raising topic, and, speaking as a layman I never had thought of it or even been aware of the scope of offshore drilling. But you speak of prevention without, as far as I can see, suggesting options for prevention. I seem to see two classes of option: internal and external. Internal would be some sort of dead-man’s switch down each hole, that shuts an internal valve passively as soon as no power is applied. That shouldn’t be too expensive, and could be made legally mandatory. More interesting is the fact that, as I understand it, such slides are serious tsunami threats in their own right. It seems to me that there should be scope for surveying all threatening slopes for their threat status, and tickling them cautiously to make them slide gently a bit at a time, but cumulatively defusing the gross threats. Like playing footsie with avalanches, a bushel at a time. Expensive? Not compared to the gross threat, which both nationally and internationally would be about as disastrous as it would be for the companies affected. Dangerous? Compared to what? Waiting for the Big One? And that is not even compared to waiting for the Big One in offshore California, where a real quake could set off a lot of slides! Disclosure statement: The authors do not work for, consult, own shares in or receive funding from any company or organization that would benefit from this article, and have disclosed no relevant affiliations beyond their academic appointment. Partners: Coventry University provides funding as a member of The Conversation UK. AUF (Agence Universitaire de la Francophonie) provides funding as a member of The Conversation FR. Peter Carson (aka pjcarson2015): Mother Nature is way ahead when it comes to minimising the effect of very variable carbon dioxide levels on climate changes, coral bleaching and ocean acidification. She’s built in a big buffer. The buffer for climate is the huge pool of water vapour in the atmosphere – 2% vs 0.04% carbon dioxide. This existence of this pool is studiously averted by AGW proponents. However, even using AGW’s own faulty infrared explanation of Greenhouse gases, changes to such a tiny amount of CO2 has negligible effect on temperatures; an improbable doubling from 0.04% to 0.08% leads to only a very maximum 0.6 C rise – quite a bit less than the scary AGW predictions of 2 C to 5 C, depending upon which faulty model is used. The buffer for corals and shells dissolution is the vast super-saturation of the oceans with calcium ion (Ca2+). A difficult to achieve doubling carbon dioxide levels lowers pH by 0.28 (8.12 to 7.84), and causing the concentration of calcium ion to increase, from the reaction of calcium carbonate with carbon dioxide, by 0.00156 to 0.00275, compared to the current super-saturated level in the oceans of 0.013 mol/kg, ie negligible. The buffer for ocean acidification is bicarbonate. Doubling CO2 decreases pH from 8.12 to 7.84, less than the current ocean pH spread of 0.3. This pH range is equivalent to a huge atmospheric CO2 range of 0•032% to 0•0697%, whereas it is usually accepted that it is virtually homogeneous. It is beyond belief for this open ocean pH range to be due to CO2. Therefore, it must be due to something else. One needs to peer well below the waves but that something else is on display with the recent Caribbean hurricanes. The preceding tropical storms gathered strength on passing over ocean heated by lava exuded seismically – as measured – from the Mid-Atlantic Ridge. There are similar explanations for cyclones and typhoons. duncan hackett, logged in via Google: This just reeks of something, I’m not sure what. It’s funny how we allow people to become billionaires, giving them subsidies, tax concessions, favourable labour laws, and a free pass to pollute the atmosphere, in the hope they might give something back voluntarily to help fix the mess they caused. Quite an amazing system. Branson owns a Caribbean island, along with so many of his rich mates, and now commands government money to help protect it. Has anyone suggested the Caribbean islands are major polluters? No. Does anyone ask Virgin Airlines to reduce its carbon emissions or at least pay for them? No. Amazing.